Over the past three years I’ve shown my work on four occasions at Tacit gallery in Abbotsford: Face/Time, with Kirsten Perry, the group shows Folded and Momentary, and last year’s solo exhibition Gooog. 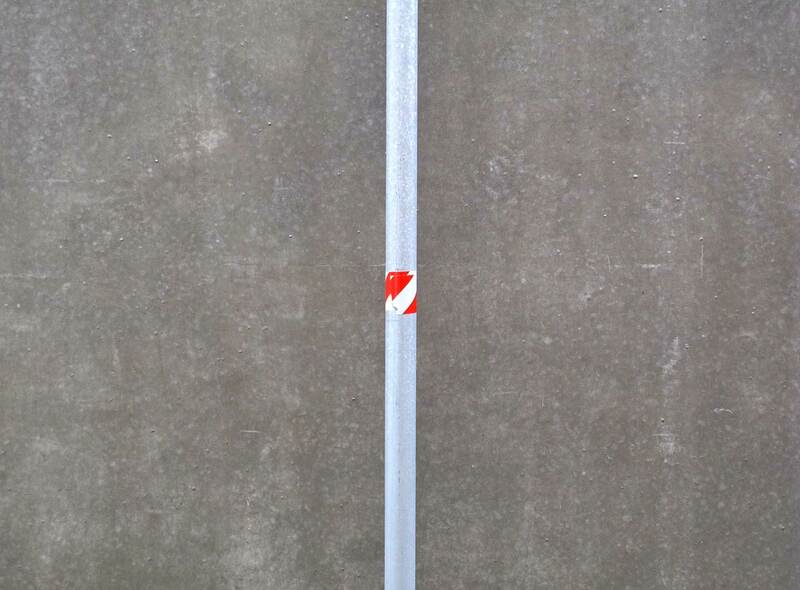 On June 10 the sixth exhibition will go up, called Man in the Street. 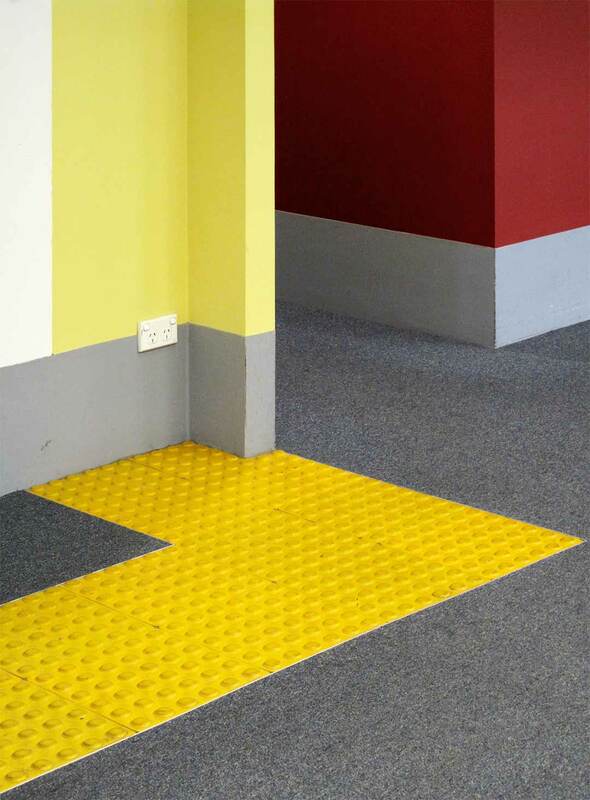 You can see my page on the Tacit Contemporary Art website. 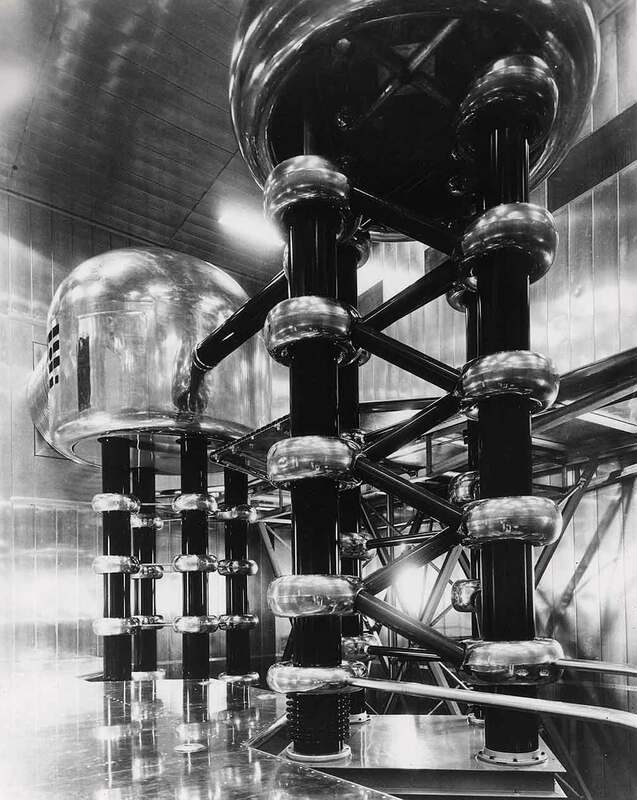 Gizmodo has an amazing set of photographs released by the US Atomic Energy Commission showing various science fictional machines use to create atomic power. The images date back several decades and evoke sci fi movies from the 1950s. To see the complete set of AEC photos, which include research into both military and peacetime applications of atomic energy, go to the AEC flickr page. Believe it or not, it has 666 photos – yes 666! Didn’t anyone tell them? 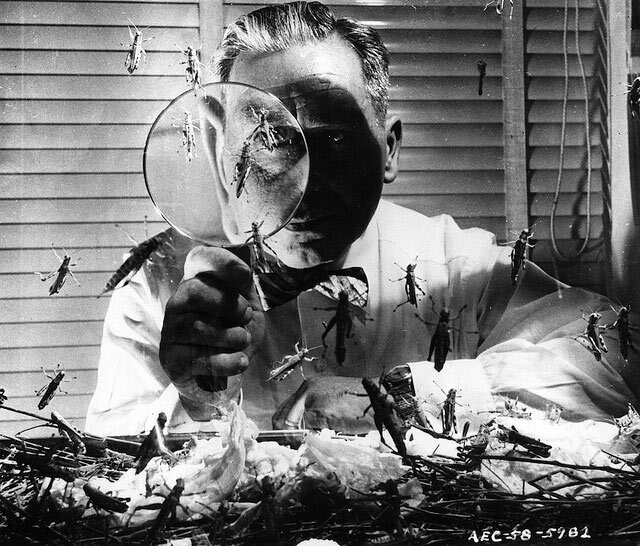 An employee inspects grasshoppers with a magnifying glass in 1958 — although for what purpose is lost. 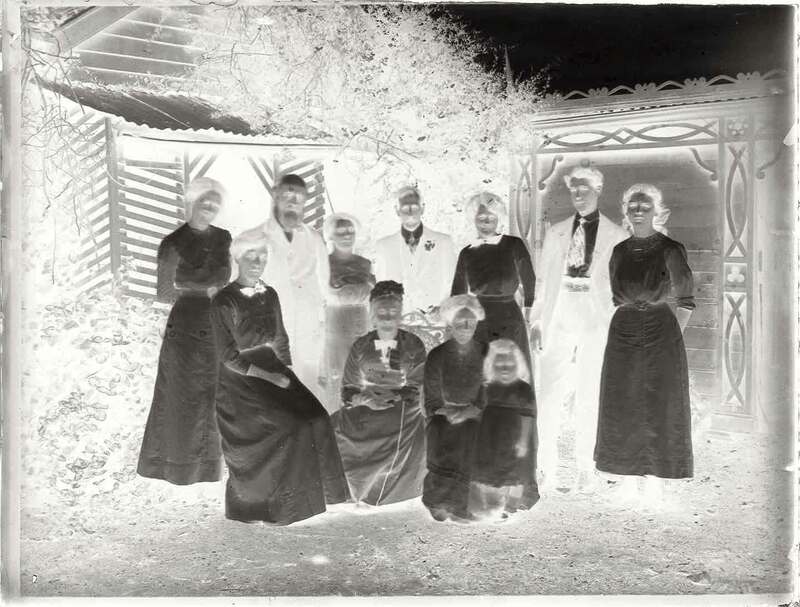 This intriguing image is a glass plate negative from around 1900. 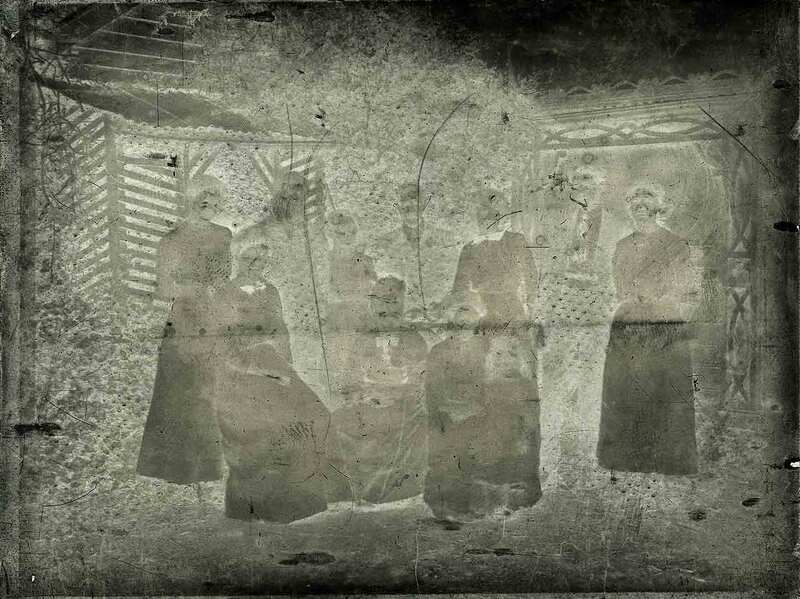 It is a dry plate film, an invention that replaced wet plate photography from the 1870s on. Dry plate was an improvement of film technology that avoided the mess and labour involved in wet plate collodion photography. In that difficult process, sheets of glass were manually prepared in a darkroom immediately prior to taking a photograph, and developed immediately after. Dry plate, like today’s films, was purchased ready to use, and could be processed at any time. The format is quarter plate, 3¼” x 4¼” or 83mm x 108mm, popular in the late 19th and early 20th centuries. The active chemical in dry plate was still silver bromide but was now suspended in a gelatin rather than collodion emulsion, thus avoiding the ‘wet’ preparation stage. Improvements to the gelatin emulsion through heating the mixture dramatically increased light-sensitivity (ISO) as you can see on the label below. 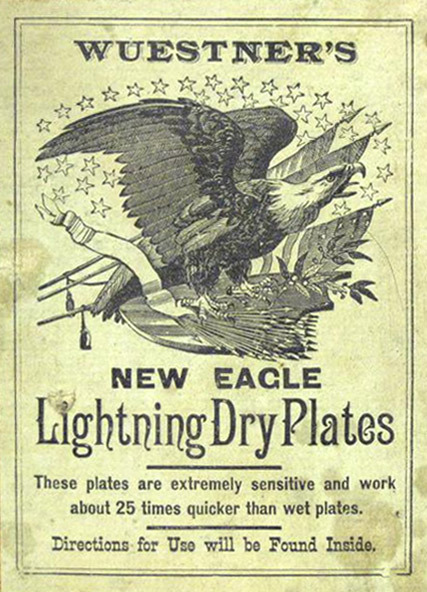 Dry plate film was manufactured from 1878 and was a revolution in photography because commercially manufactured film could be purchased as desired, used at any time and developed at any time. The standard support was a sheetof glass with the film emulsion already applied. Flexible cellulose film base took over in the early decades of the 20th century. A document scan picks up the surface detail of the negative. 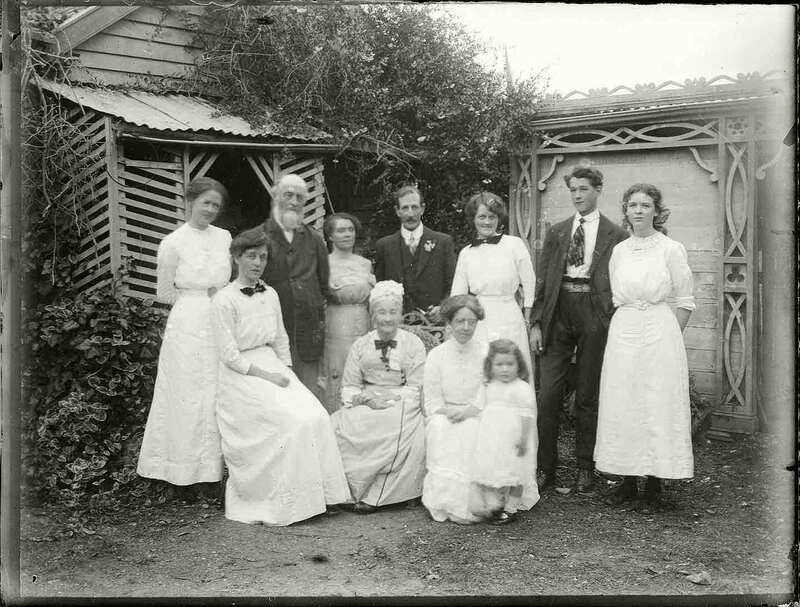 Since the provenance of the negative is unknown, except that is was purchased in Gippsland, no camera can be guessed at; was it a commercial photographer or a family member behind that camera? The neat arrangement of figures suggests a commercial hand at work. The positive image show it as a family group in Victorian or Edwardian dress; the young man’s suit and tie suggests the latter period. The family is grouped around the matriarch in white bonnet. Four generations are pictured, a notable occasion worthy of a formal photograph in those days of infant mortality and early death. They seem neither wealthy nor poor, and the scene could have been in the country or the city. Their neat clothes contrast with the untidy architecture. It is notable that all the women wear white. 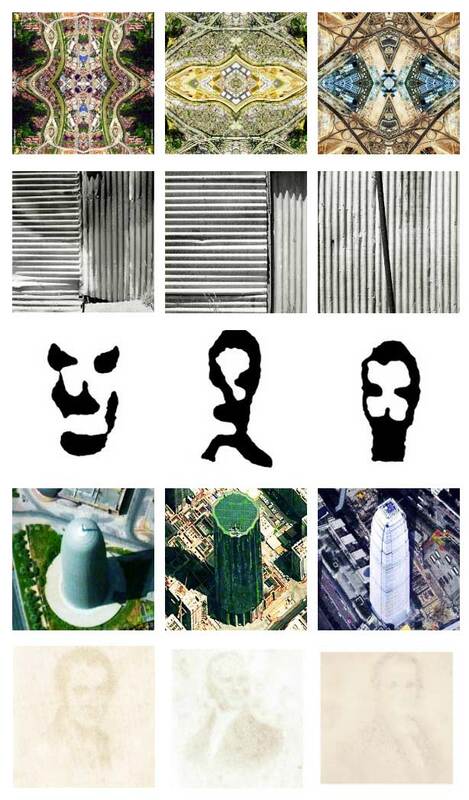 Frustratingly, there are not enough firm clues to be certain about the photograph’s details. It’s full of stories, but you have to make them up yourself. As the great camera manufacturers cut back or even close down their film camera production, there are opportunities in the market for small operations. One such is a partnership called Svedovsky, run by two carpenters in Poland. They make a 10×8 field camera plus a wide-angle variant of it, and that’s about the whole operation. It appears to be a very nice product. 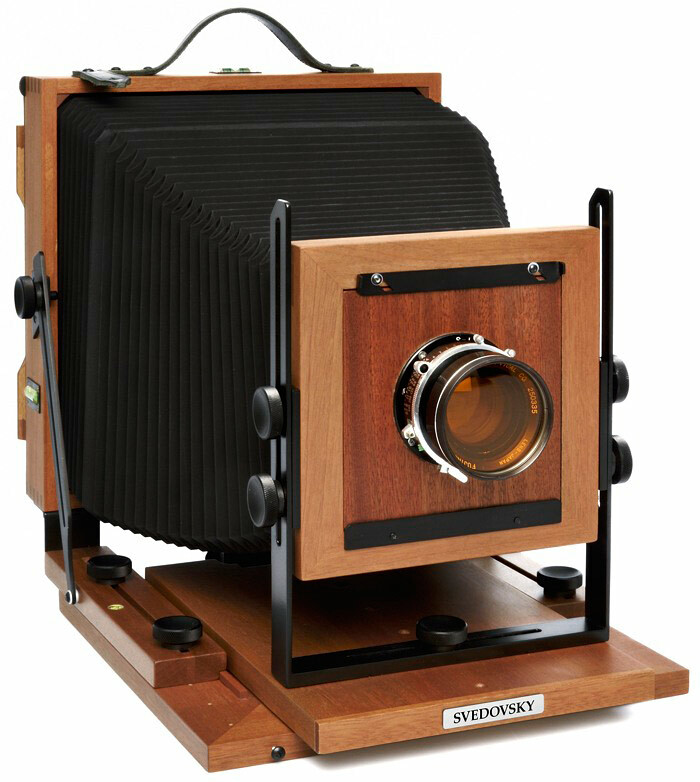 Svedovsky 8×10 is my latest large format camera concept, created with a help of my associate Paweł Osiński. Together we have been managing a carpentry company for fifteen years in artistic carpentry. I have been a photographer for a good part of my life. What I missed about many view cameras available on the market was stability of used materials. For this reason I have decided to create a real working horse, a camera durable enough to stand years of usage under changing conditions and in difficult photographic situations. Svedovsky 8×10 is designed using only the best materials. 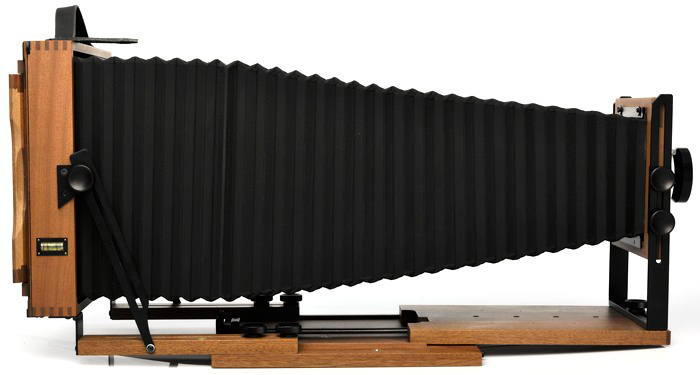 The website, at svedovsky.com, shows the camera in all its extensions and movements and reveals it as a beautifully crafted tool for the large format photographer. It’s made out of mahogany, titanium and steel and is built to last. According to the review by Hubert Banaszkiewicz (admittedly on the Svedovsky website), the camera is fast to set up, stable in a wind, has a very clear focussing screen, and precise focussing. The Svedovsky sells for US$1800, which will be roughly AU$2500 including GST. That’s without a lens, of course. Jo Whaley has been making still lifes since the 1980s and her work has been widely published and exhibited. 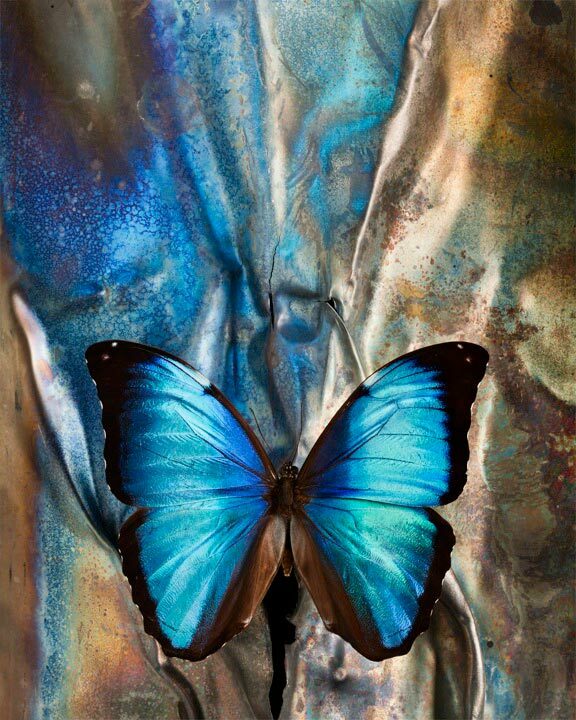 Her book The Theater of Insects came out in 2008 and contains many of her beautiful colour photographs. Pareronia Valeria (above) is a species of South Indian butterfly known as the Common Wanderer; it is a beautifully ‘designed’ creature. 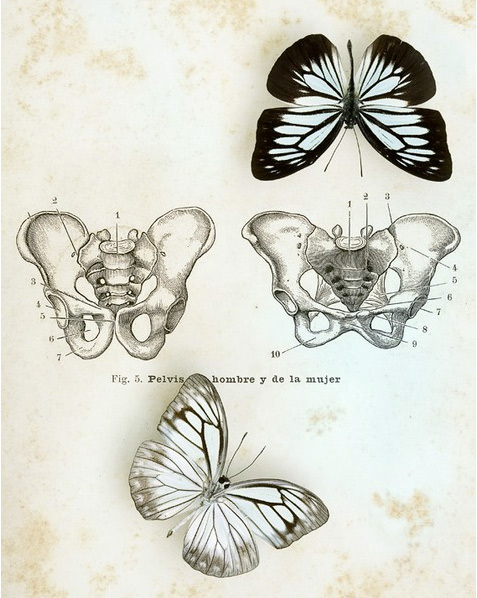 Whaley’s photograph shows a male and female arranged on top of a medical illustration labelled ‘pelvis of the man and the woman’. It shows the differences between the sexes and the resemblance between species. Acrocinus longimanus is known as the harlequin beetle because of its elaborate coloured pattern on its back. 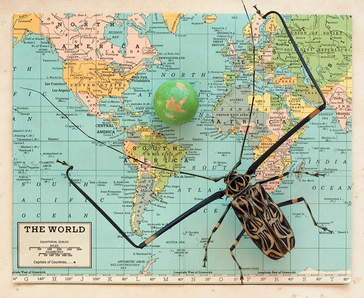 It is native to Central and South America, although it seems to want the whole world with its absurdly long forelegs. 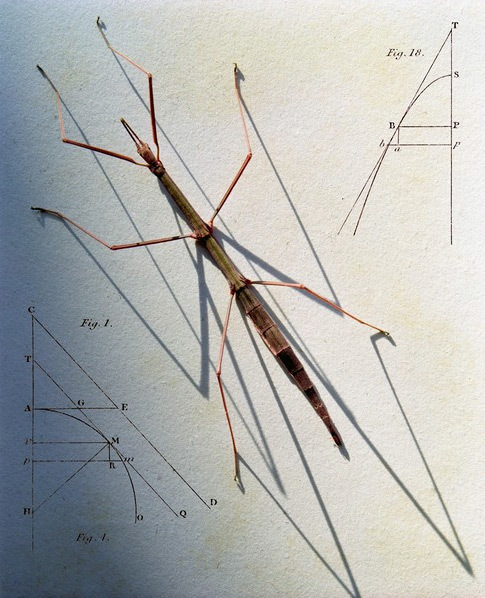 Phasmids are named from the Latin word ‘phasma’ meaning phantom or apparition. Since most of them camouflage themselves as sticks and leaves they seem able to disappear like ghosts. But this spectral quality is countered by their hard linear forms, echoed in the picture by the geometric diagrams. 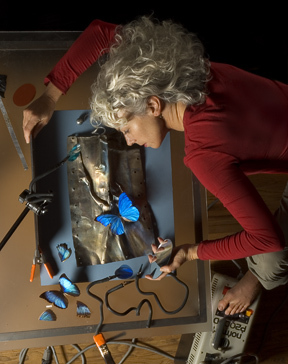 Jo Whaley at work on Morpho Deidamia. Whaley talks about her practice in terms of theatricality; the still lifes are arranged with the same kind of detail as stage sets. The props, backgrounds, lighting and colour only come to life when every element is in place. She learnt this skill when she worked for the San Francisco Opera as a scenic artist, fresh out of art school where she majored in painting. In a way, she is still a painter and still a scenic artist.